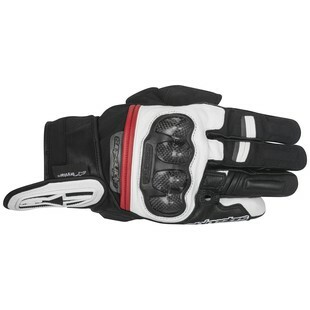 All weather, short cuff motorcycle gloves are hard to come by. Seems like a concept that would be more adequately fulfilled by this point, but alas, the selection of options that are truly reliable has traditionally been limited. With the introduction of the new Alpinestars Rage Drystar Gloves, that pool has been expanded. I never expected to be happy about Rage, but these new Short Cuff Gloves from Alpinestars have done just that. Consider them the GP Air Gloves for the rain, offering waterproofing instead of venting. A-Stars has been wowing us with their glove improvements recently and the Rage Drystar only adds to the warm fuzzies we get when listing the features. TPR palm sliders and reinforced side seams gives this glove solid protection, while the Touchscreen compatible index finger makes the Rage not only safe, but a user friendly short cuff option for cruising in the wet. Safety, durability, and Drystar waterproofing. That is what the Astars Rage gloves bring to the table each and every day. And it is a table that is happy to have them.